Does your store stand out from all the rest? It should! 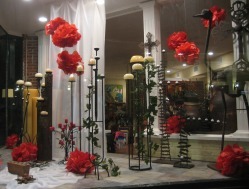 We create wonderful window displays for every budget. Tell us your fantasy or let us create one for you...Holidays, Sales & Promotions, featured new products...they all deserve special treatment! We will fine-tune your store interiors with thoughtful and creative placement of your merchandise. 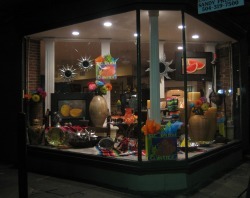 Clients will shop with enthusiasm when your store is attractively arranged and well organized. We see both the big picture and the little details and will make shopping in your store an exciting experience. Weekly & monthly maintenance plans are available, as well as special event planning. Let us work our magic in your space! Draw attention to your store & your merchandise with attractive custom signage. 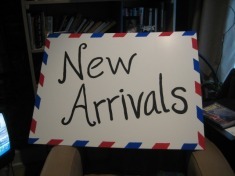 Based on your budget and style, we create signs for display cases, front windows or for special occasions & sales. This design was built upon the "New Arrival" theme, using shipping boxes, bubble wrap and packing materials as props to bring attention to new merchandise. "Fragile" tape was put up on the exterior windows and had the same fascinating effect as crime scene tape... interested passersby were stopping almost immediately after installing the tape. Sales from this window were brisk!